Yes, I haven't blogged in a long time. I've got a few things saved up to blog about, so I'll be catching up over time. I had a good day at the event on April 15th, 2007 in Tempe, Arizona. My race was marred only by heavy winds on the bike and some stomach problems on the run. I achieved my time goal of 12 hours, finishing in 11:53. I was 489 out of about 2066 starters (top 25%), and 99/330 in my Men 40-44 age group. I was bottom third on the swim, which was good because last year I was bottom tenth. That’s a big improvement for me, since swimming is my weakest sport. I was top 40% on the bike with 6:11, which was an improvement over bottom 40% last year. And I was top 13% on the run, which was great although I was hoping to break 4 hours and came in at 4:05. For perspective, the winner Rutget Beke of Germany’s times were 8:21 overall (0:52 swim, 4:30 bike, 2:54 run) and the M40-44 age group winner David Jones was 9:48 (1:06 swim, 5:06 bike, 3:28 run). Race Plan: Working with my coach Jill, the plan was a steady swim, a heart rate based race plan (148 first loop, 150 2nd loop, 152 3rd loop, maybe a little harder on the 3rd loop if RPE is good), and then a "go for it" sub 4 hour, negative split marathon based on a pace for each of the 3 loops. I had these numbers written on a card in my T2 bag. Swim: The 2.4 mile swim takes place in Tempe Town Lake, which is man-made from damming the otherwise dry-most-of-the-year Salt River. It’s yucky – it’s a 2 mile long, ¼ mile wide Lake Bill. The locals can’t imagine people swimming in it, and indeed it’s illegal except for special events. My 1:23 swim was uneventful, although I now know why people refer to Ironman swimming as a full contact sport. I was kicked in the shoulders, swatted numerous times on the legs, and partially swam over twice. I managed a fairly straight swim and better than last years, where I zigzagged probably an extra 300 yards. I came out of the water in good shape, not dizzy and I experienced no cramps on the swim, although I had one minor calf cramp as the suit strippers took off my suit. This was easily my best long swim ever. Bike: The 112 mile ride is a three loop out-and-back affair on closed local roads. The “out” portion enjoyed a steady 20-25 mph tailwind/crosswind, with gusts to 35. The “back” portion suffers the same wind as a headwind. Many people called the winds “brutal” but I like to call them “epic”. Keep a positive outlook. I dodged a number of rolling bottles, one bicycle crash directly in front of me, a lot of blowing dust, and one four foot tumbleweed that sailed by a foot in front of me at about 30mph closing speed. Surreal. 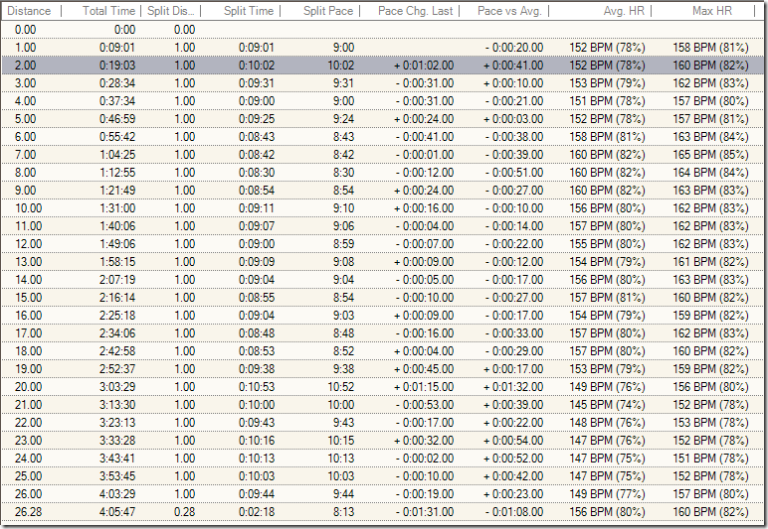 Keeping with my race plan, I raced only by heart rate. I only turned my GPS on twice to see my speed with the tailwind (28+mph) and against the headwind (17-). My nutrition plan was working out OK but not great. I had some issues with drinking enough since I wasn't good at staying on the bars and reaching for the bottles behind me. I ended up drinking larger amounts less frequently than I planned. I didn't like feeling like I was losing time whenever I needed to drink. And I failed to remember the electrolyte-tablet-an-hour plan at least twice. I was using PowerGels in gel flasks, and those were working out well. I had one potty stop at special needs, where I grabbed another gel flask and popped a tablet. Overall, the bike leg went well and seemed remarkably short for a 112 mile ride. Run: The 26.2 run is a three loop figure eight where you pass the starting area six times. My race plan was a four hour run, and I was feeling good coming out of T2. But after only a couple miles, it was clear I wasn't really getting into the running. Holding pace seemed harder than it should have. But I pressed on. I had been needing to pee for a while, but I skipped the long porta-potty lines at T2 and used the nice clean public restrooms at the boat launch area at around mile 5 or so. That worked out much better. Somewhere around mile 14 I started feeling a little ill, and by mile 16 I felt I was slowing down, although my GPS data shows I actually wasn't. My stomach felt full of liquids and I had skipped the tablets in my special needs bag, and that was a big mistake. I think the all-liquids plan was just too much fluid for my stomach to process, or perhaps I was low on sodium etc. I was fantasizing for a while how great it would be if I could just get sick enough to throw up and feel better rather than just feel nauseous. But alas, no such luck. I suffered for a while until the first aid station with chicken broth at around mile 21, which tasted awful but I loved the salty flavor, if that makes any sense. You can see from the GPS data below that mile 19 and 20 were really slow, but then I picked up the pace a bit. In my head I thought I was giving up a little time, but that I was still going to beat 4:00 by a comfortable margin. I even told Jill when I saw her after the finish that I did "around a 3:55 or so". I was floored that my time was 4:05, but then I realized my mistake: that elapsed time clock at T2 was for the pros who started at 6:45 am, not 15 minutes later. So there was a 15 minute offset in my timing calculations that I had attributed to the bike leg but in reality was part of the run. Here are my splits for the three laps. I had no idea my third lap had slowed down so much until I saw this data. I also felt I had picked up the pace the last few miles, but the data shows I really didn't. Lap splits. You can see that my average heart rate was good (near my lactate balance point of 155) for the first two laps. I wasn't really holding back early on so much as trying to negative split each lap, and I was on the numbers Jill and I had calculated for the first two loops. 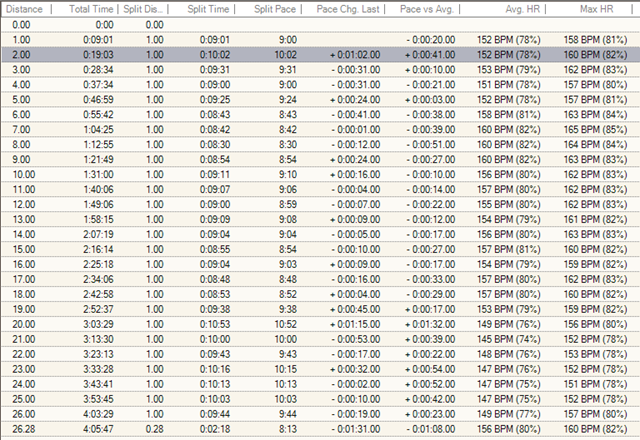 The HR data suggests I could have ran a bit harder than I did, maybe 10 seconds faster a mile. By mile splits. I think I would have nailed my time goal had I not given up so much time the last loop being sick.